So after all the public pressure, Samaa TV apologises, says the programme that was broadcast (moral policing, intrusion of privacy) does not reflect their policy, and that it won’t happen again. 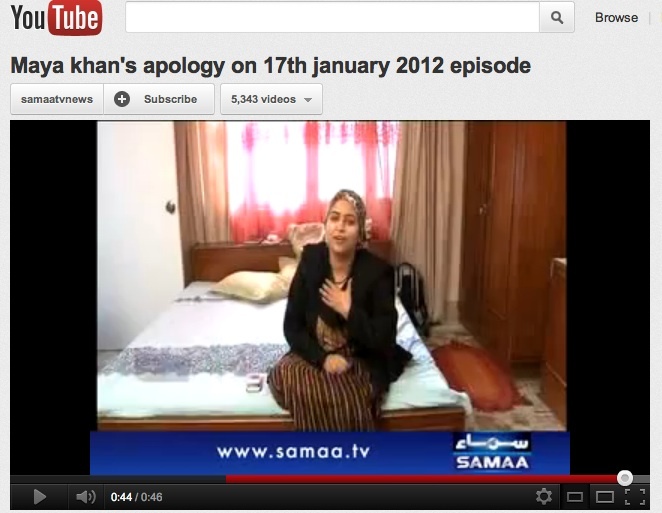 The anchor says that the programme host Maya Khan has also apologised – but the apology we are then shown is no apology. Sitting in a bedroom (bedroom??!) with her hair wrapped up in a turban, she smilingly says she didn’t mean to hurt anyone – ‘agar meri waja se kisi ki dil azari hui mein tahe dil se muafi mangti hoon‘ (IF I have hurt anyone I am really sorry). No acknowledgment that what she did was wrong, that she lied about turning off the camera. So the campaign continues. It’s not about Maya Khan. She can do what she likes at home. But it’s not acceptable when she brings that ‘moral policing’ mentality’ to 24/7 live TV and reality shows – whether it’s her, or Yasir Aqeel of ARY or anyone. Thanks for posting this other clip. I am APPALLED that this Maya woman has been doing such shows for so long and has been allowed to do so! In this one as well the girl was LIED to, to be brought to the show, and despite her repeated requests to stop interfering in her personal life Maya and her brigade continued to put up this self-righteous act. SICK !! This says a lot about the real “policy” of the channel and the seriousness of Mays’s so-called apology. You are right, the campaign must continue. A strict action should be initiated agaist her. She is doing pathetic. She is working out of her brain. Sama tv has taken a good step to remove her fron channel. Other media anchors should also be learned from her insulting attitude. what maya khan did was wrong! privacy is right of every individual but what we really need to ask here is: were we protesting against our right to privacy or maya khan invading the dating couples in a park? I think its the latter… cause there is much wrong in the society and we hardly rise against that… yes, so probably we were all furious on maya khan because she was doing something we all dont want to be caught in. how about we protest against all the wrong practices taking place in different institutions… hospitals, traffic polices stations, government offices… and at so many other places every single day? I believe we need to evaluate ourselves first! are we the hypocrites we have been labeling maya khan all this time? lets all of us commit ourselves to good and change will come at large. Lets practice good ourselves first, before we point fingers at someone else. Lets say no to bribe, observe patience, follow traffic rules, hold ourselves accountable and spread the same in our circles. This video illustrates this beautifully: http://www.youtube.com/watch?v=rhOfYzzS6D4 Lets make a pledge to make our country a better place! Pleading is the first step – lets take it NOW! Maya answers the critics??? Bilal Lakhani is on twitter saying that Maya Khan will be coming on Kamran Shahid’s show Monday night on Express news. Rumour has it that she is going to join Express and this is going to be her ‘big apology’ to win back fans and critics with rhona dhona and insincere words of regret. Shame on Kamran Shahid for giving her this platform. Hasn’t HE learnt from the Balouchistan show that ratings aren’t everything? very bravest and admireable performer and great lady of pakistan .maya khan dont worry loversof honesty are with u .
MAYA KHAN U R RIGHT DONT WORRY. ALL THE BROAD MINDED PEOPLES LIKE U AND YOUR GOOD PERFORMANCE .YOU ARE THE ASSEST OF PAKISTAN.I M YOUR BROTHER AND SUPPORT TO U .
the great maya khan .we all of hyderabadi salute to u and your bravest and goodest performance .plz dont mind talks of some narrow minded peoples of pakistan . majority of pakistani support to u . Really I want to appreciate to you! I always see your all program regularly. MAYA KHAN U R RIGHT DONT WORRY. ALL THE BROAD MINDED PEOPLES LIKE U AND YOUR GOOD PERFORMANCE .YOU ARE THE ASSEST OF PAKISTAN.I M YOUR SIS AND SUPPORT TO U .
I understand ARY is hiring Maya Khan. Please note that Maya Khan was let go (or fired) by Samaa TV for refusing to offer an unconditional apology for her actions; nothing has changed on that front. By hiring her are you sending a message to others that to behave badly to increase ratings is okay, and it does not matter if you get fired, because someone else will be standing in line to hire you. I am copying the over 5,500 individuals and organizations who supported me on the initial petition. I will copy them on your response as well. I know one thing that this fake world will never accept the bitter realities of world because; this is a time to end of this world. Everybody is saying she was wrong and she did wrong thing. In my point of view and Media, people who want to do or watch these same activities as per their needs. They will always say that she did wrong job. This is the fact what media is showing but have they ever showed videos of parties they celebrate with foreigners / diplomats. They drink and dance with them only for breaking news. Has she not ever left her home for date. Definitely this not good in our society but why don’t they chase their celebrities. You guys can watch their scandals on utube. Anyways, i request all the younger generation not to go towards destruction of moral and society.